Ask a salesperson what they need from marketing and they will say, more sales leads. Give them more and the next time you talk to them they will say you misunderstood them and they need more qualified sales leads. 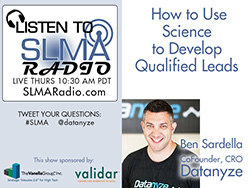 In this SLMA Radio program we speak with Ben Sardella, co-founder and chief revenue officer from Datanyze about how a marketing department can make good on its promise of creating qualified leads by using technology. As co-founder and chief revenue officer, Ben oversees Datanyze's daily sales, marketing and business development operations. Before Datanyze, Ben served as VP of sales at Kissmetrics and started his career at NetSuite, where he pioneered the SaaS sales process. Ben is currently a mentor and advisor for a number of successful startups including Yesware and LaunchPad LA.